Often time I’m asked about USB headsets. Many times companies require their agents to occasionally access training sessions via USB and are informed they will need a whole separate headset. I have an alternative that will allow you to buy just one headset and switch out the cord to work with both the telephone dial pad and a USB plug. The Pro Series, Air Series and Flex Series headset telephones that I sell come equipped with what’s call a Quick Disconnect feature allowing you to change out the bottom cord of the headset for the optional USB cord. You do not need a separate USB headset! Simply choose the option to add a USB cord to any of these units. 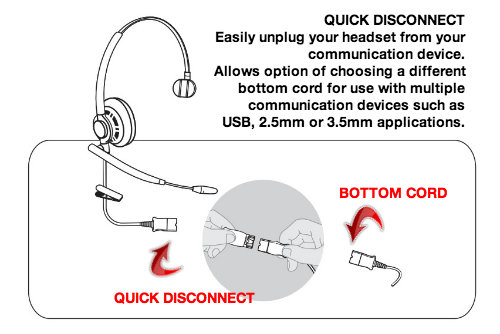 * The Eco Series headset telephone units do NOT have the quick disconnect feature and cannot convert to a USB headset.